Yes, it’s true. Once Upon a Table first debuted a scant ten years ago today. Can you believe that much time has passed? What? You can? Yeah, I guess it’s not that much of a stretch, really. So what does this mean for the future? Well, for starters, I have my work cut out for me on the 20th anniversary comic. There may even be other updates before then. But… perhaps you have questions? Are you re-launching Once Upon a Table? Not yet. 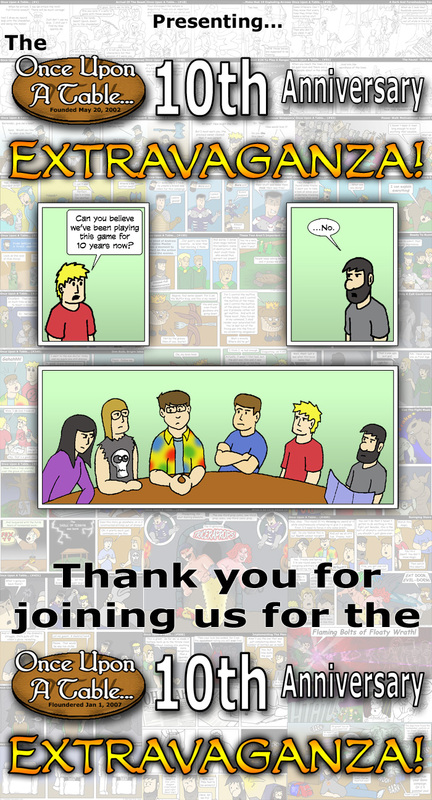 A year ago I had hoped to use this anniversary to re-launch in a way that would be stable for the long term. If you recall, I tried that once before. This time I recognized the problem signs before starting the race. Are you ever re-launching Once Upon a Table? Maybe. I want to, but I need to find a way to create quality comics without risk of disappointing my entire audience. Or myself. Again. What’s stopping you from re-launching Once Upon a Table? What’s been stopping you from re-launching Once Upon a Table for the past six years? You’re starting to sound like a broken record, mate. These questions are getting… repetitive. But, if you must know… laundry. I’ve been doing laundry. Then why are you still wearing that same shirt? I have taken very good care of it.